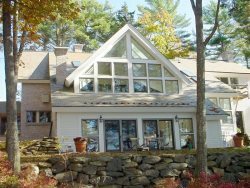 The Yellow House is a magnificent old family summer home overlooking the Damariscotta Harbor, perfect for a classic Maine vacation or family reunion. The property has a unique blend of privacy, natural beauty, and convenience. Enjoy a quiet sunset over the water from the large, West-facing porch, steps away from Damariscotta’s charming downtown. A massive sloping lawn flanked by mature trees provide cover for noise and sight-lines creating a sense of seclusion, despite the proximity to town. A quick two minute walk down a quiet side-street provides access to Damariscotta’s restaurants, shops, galleries, and bars, a local movie theater, and a lovely bookstore. Pop out for a coffee and pastries in the morning, grab a lobster roll for lunch, enjoy renowned Pemaquid Oysters and a beer at Schooner Landing in the evening, or take a walk after dinner for an ice cream cone. The house has wonderful character and has been a gathering place for families for decades. There is a large kitchen/pantry (currently being redecorated) that opens up to a central sitting room perfect for morning coffee, card games, or relaxing throughout the day as people come and go from the home. There is a large dining room that can seat up to 14 people, open to a living room with a big leather sofa and 4 sitting chairs. The waterfront backyard offers an ideal venue for lawn games: whiffle ball, horse-shoes, and croquet.